A new study out of China appears to show that eating certain spicy foods might lead to increased longevity. Via the NY Times’ Nicholas Bakalar, the study, published in BMJ, featured participants enrolled from 2004-2008, then followed over a 7-year period. 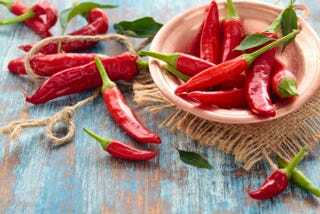 Overall, 485,000 people were part of it, and researchers found that after controlling for pertinent variables, eating spicy food (particularly chili peppers) at least once or twice a week produced a 10% reduced overall risk of death. The number actually went up to 14% if someone was eating spicy food six to seven* times a week. Specifically, the rates of heart disease, cancer, and respiratory disease were all lower in spicy food eaters. Though the researchers had no specific explanation as to why spicy food appears linked to longevity—and stressed that further study is needed in order to verify these results—they did point to the fact that previous studies have shown that capsaicin in chili peppers has significant anti-inflammatory and antioxidant properties. Hold on, I have to go convince my one extremely health-conscious friend with absolutely no spice tolerance whatsoever that he’ll live longer if he eats ghost peppers. This should be hilarious. * Christ, I like spicy food, but there are limits.